“Of the Rain and Giuseppe, Dreaming”, Giuseppe looks out the window at the rain on a dark March afternoon, one of four photos in the series. 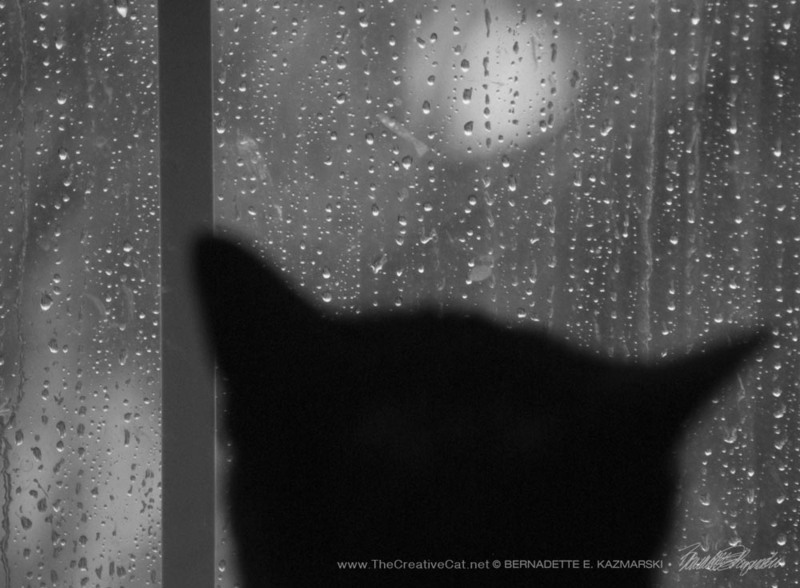 “Of the Rain and Giuseppe, Dreaming” is one of a series of photos I took of Giuseppe looking out the window at the rain and have always thought they’d be able to convey a variety of messages as photo cards, each of which can be found in my Feline Photo Greeting Cards gallery, and also attractive photo prints, which you can also find in my Cat Photos and Black and White galleries. I could hardly pass up the mood and the composition, chose six of all the photos I’d taken, decided they’d look best in black and white and set them up as a photo short story on The Creative Cat in Of the Rain and Giuseppe. Giuseppe often gazes out “the big north window” dreaming in eloquent and sometimes lyrical terms of his precious French-Canadian Mlle. Daisy Emerald Marguerite who lives up the hill in faraway Canada, and who in real life is kept safe and loved by a friend in Hamilton. She and I enjoy composing messages back and forth in very purple Victorian prose, I enjoy the exercises in writing in a different style and subject matter, and we all have a great laugh, except Giuseppe who is a little insecure. I think a card should look special when it arrives, but not with something that announces grief and sympathy. A simple colored envelope will do, and I offer colored envelopes with most of my sympathy cards. While I’d really prefer just a plain pale silver gray envelope to complement the black and white photo in addition to standard white, the gently threaded pattern of the “Granite Recycled” envelope coordinates well with the gentle shadows in the photo.